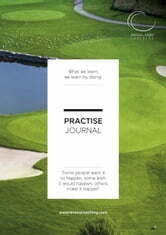 If you want to improve your golf game then this practise journal is for you!? The intention of this practise journal is to become your golfing bible. It will guide and assist you in achieving your golfing goals and help you get better faster. This manual summarises over a decade of work discovered on a journey of personal study, analysis and trial and error. First-hand experience tells me the majority of golfers fail to reach their potential because of their practise habits. They are unsure on what, why, and how to practise, and unsure how to reflect and measure their golf games, in order to move forward. Without these answers, preparing and designing practise with precision and purpose is almost impossible or irrelevant. This Practise Journal will help guide you to these answers and help you develop habits for sustained improvement. This journal with help you practise every key area of the game. It is designed to challenge and stretch you so you grow and develop. It will test you technically, mentally and tactically, which will result in giving you more skill. Developing skill will yield better results out on the golf course, the place where it actually matters, under the gun and when the pressure is high. It's now over to you! Good luck in your Journey.